Thus it’s important for decision makers weighing whether or not to approve major energy projects to consider, among other factors, the ethical record of the project applicant. Pattern Energy seeks to build the Ocotillo Express wind facility on Bureau of Land Management property in Imperial County. It also has an application pending for a wind project in the Kitchen Creek area near Campo, in San Diego County. The company has made a good-faith effort to endear itself to many in the region, bestowing $3 million for local education programs, for example. Pattern has given money to a local Soroptomist club, to the Imperial Valley Food Bank, and other community groups. Critics have noted that such charitable giving may be motivated by a desire to curry favor with groups and individuals, many of whom spoke in favor of Pattern’s project at a recent Planning Commission meeting. The benefits to the community, however, are genuine. But so are the negative aspects of the project, including destruction of public lands and wildlife habitat, health risks posed by infrasound and potentially, dirty energy, annoyance caused by audible noise and blade flicker, view destruction, and seismic safety concerns. Such concerns beg the question: If something goes wrong, can Pattern be counted on to take responsibility and do the right thing? Pattern won't discuss its project with ECM. But a look at Pattern’s history may provide some clues. In June 2009, Riverstone LLC acquired Babcock & Brown’s North American energy business, including San Francisco-based Pattern Energy. More details on the merger can be found here; Riverstone’s plans included infusing $400 million into Pattern’s renewable energy endeavors. The company’s interests include major holdings in gas and oil exploration. Riverstone is also in the transmission line building business, generating revenues off the electric lines that connect to its wind energy facilities. Riverstone has a checkered record on the ethical front. In 2009, the company’s founder, David Leuschen was ordered by New York Attorney General Andrew M. .Cuomo to “pay $20 million in restitution to resolve his role in an investigation of corruption involving the state pension fund. Mr. Leuschen’s private equity firm [Riverstone] has already paid $30 million in restitution in the case,” the New York Times reported. According to Cuomo, the state pension fund invested $150 into a joint venture between Riverstone and the Carylyle Group in what was described by ABC news as a “pay to play” corruption scandal. Carlyle's 2009 Annual Report confirms that Carlyle founded Pattern Energy. Riverstone Holdings formed a joint venture partner of the Carlyle Report, Bloomberg News reported. The Carlyle Group is one of the nation’s largest and most politically connected private equity firms. Over the years it has employed former president George H.W. Bush and former British prime minister John Major. The company is known for its military contracting businesses and also holds major stakes in hedge funds and other interests. Caryle investors in the past have included the bin Ladin family. The company has been the target of many conspiracy theory websites on the internet through the years: http://www.conspiracyplanet.com/channel.cfm?channelid=102&contentid=928 http://www.conspiracydigest.com/carlyle_group.html. Carlyle’s founder, Frank Carlucci, is former Deputy Director of the Central Intelligence Agency (CIA) and former U.S. Secretary of Defense. He drew controversy while stationed in the Congo, when rumors surfaced accusing Carlucci of having a hand in the assassination of a Congolese official. Carlucci and the CIA have denied this, according to the Encyclopedia of the Central Intelligence Agency. The book The Iron Triangle: Inside the Secret World of the Carlyle Group claims that Carlucci and/or Carlyle entities have been accused of arms scandals and bribery. Green energy offers opportunity for Riverstone, through Pattern, to diversify and ride the wave of renewable energy--as well as capture the "green" in federal subsidies for such ventures. Today, Pattern Energy operates or is building over 520 megawatts (MW) of wind projects in North America, with a development pipeline in excess of 4,000 MW, according to the company’s website. Those have not been without controversy. Hawaiians understand full well the importance of reliability in a wind turbine operator, since a wind farm at Kamaoa, Hawaii was abandoned, forcing HECO to shut off power in 2006. Across the U.S., over 14,000 wind turbines have been abandoned, the Hawaii Free Press reported in November 2001. In Nevada, Native American tribes and environmental groups filed suit seeking to stop Pattern’s proposed Spring Valley Wind project in 2011. In Texas, environmentalists and a local rancher sued in an effort to prevent construction of the Kenedy Ranch wind project back when Brown & Babcock proposed to build the project now run by Pattern. Opponents, lost and the project was built. Since then, Pattern’s Kenedy Ranch site in Texas, located in a major migratory flyway, has drawn controversy for bird kills. That includes an article in the San Antonio News Express titled Wind Farms and Deadly Skies which criticized company studies touting radar as an effective means of reducing massive bird kills. The article cited evidence that studies were neither credible nor conclusive, noting that work was paid for by the wind energy companies and results were not peer-reviewed. In its application to the California Public Utilities Commission for Pattern’s Ocotillo Express wind project, San Diego Gas & Electric Company lists the Kumeyaay wind facility on the Campo Indian reservation among its “success” stories. The application fails to mention, however, that in December 2009, the wind farm blew apart in a storm. A witness described a blinding blue flash that radiated through the wind facility. “All 75 blades from all 25 turbines were removed and only some of the FAA required lights are working,” Boulevard Planning Group Chair Donna Tisdale told East County Magazine. Portions of heavy blades whirled off, scattering debris far afield. The wind facility was off line for over three months, producing no electricity. 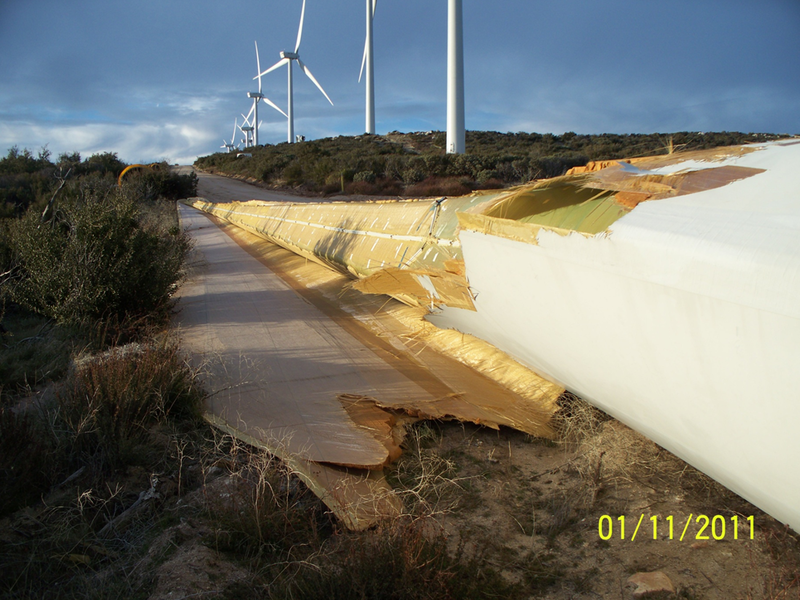 Fallen blades and rusting turbine parts remain strewn across the ground more than two years later, with litigation ongoing between the tribe and Gamesa, maker of the turbines. Pattern has stated to Imperial Valley planners that it now uses as different blade manufacturer. Pattern has repeatedly refused to answer questions posed by multiple media outlets regarding serious seismic safety issues involving the Ocotillo project’s location on an active earthquake fault. The Ocotillo project also faces stiff opposition from residents, environmentalists and Native American tribes. Multiple groups have filed appeals of the planning commission’s approval and some are gearing up for legal action if Supervisors don’t block the project. The project has community support, however, from Chamber leaders, nonprofits that accepted donations from the company, and labor groups seeking construction jobs. However, a video at the planning meeting caught Pattern spokesman Glenn Hodges on camera admitting that Pattern will guarantee only ONE permanent job at its Ocotillo site—falling far short of the 20-30 permanent jobs discussed in preliminary project documents. Ocotillo isn’t the only place where Pattern is facing opposition to its projects. In Puerto Rico, dozens of protesters barred a Pattern Energy wind site, including six who were arrested. Pattern is currently proposing a 146,000 acre South Kent wind facility in Ontario, Canada, where it faces opposition from the Ontario Wind Resistance group, a citizens’ organization that is mobilizing Canadian voters to oppose budget funds for wind farms. The biggest obstacle, however, may be in Washington D.C. Pattern and other wind developers face a daunting challenge if Congress fails to extend renewable energy subsidies set to expire at the end of this year. Thus far, the Senate has voted down the subsidies, which include massive funding for wind energy development, multiple times. If the subsidies fail to win renewal, Bloomberg News predicts installation of turbines in the U.S. may fall by 95 percent next year. Pattern told planners last month in El Centro that completing most construction at Ocotillo before the end of this year is critical to assure that federal payments will received. The reason we know nothing about Pattern Energy is because the people behind this taxpayer raid want to remain anonymous. If you followed the trail there would be some big surprises. One of them would be that many of these same faces are behind Iberdrola and Iberdrola Renewables. Anyway the point of all this is that wind industry is truly represented by a disgusting lot. It is nice to see them finally getting some of the exposure they deserve. In time people will realize that this industry is on the same path as the financial institutions were with their hedge funds. If they are not stopped, they will bankrupt the worlds ecosystems for their profits.......... to the point of no recovery.